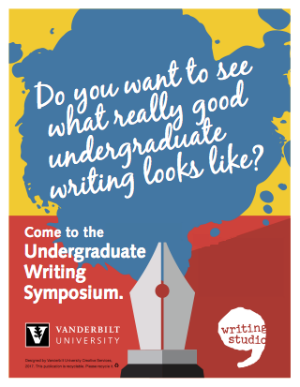 The Undergraduate Writing Symposium provides an opportunity for Vanderbilt to celebrate the achievements of its undergraduate students. We welcome students’ self-nominations of argumentative essays, research reports, creative pieces (fiction, poetry, etc.) and other writing projects that can be read aloud. We also encourage multimodal compositions that showcase Vanderbilt students producing pieces that stretch how we define “writing” in our digital age. Any piece completed during the 2018 calendar year is welcome to compete for inclusion in the event. To nominate your own writing for the Vanderbilt Undergraduate Writing Symposium, please fill out the form below. Each student may nominate and submit up to two of their own papers. New for First-Year Submissions in Spring 2019: This year all first-year submissions to the symposium will be competing for inclusion in a digital first-year showcase to be featured at the symposium. Following our review process, the authors of the highest scoring submissions will be invited to prepare their pieces for digital publication and to submit a short video of themselves reflecting on the writing of the piece and what they learned. (Guidelines will be provided to finalists.) All pieces included in the digital showcase will also be eligible for prizes in several categories, which will be announced during an awards ceremony at the symposium’s conclusion. Formatting: Papers must be a Word Document and saved under the student’s name and have all identifying marks (name, class, professor, etc) removed from the paper and the header. Digital Compositions: See instructions below for submitting multimedia projects. If removing identifiers from such projects proves difficult or impossible, we understand and will adapt our review process accordingly. Please contact Beth Estes, Academic Support Coordinator.